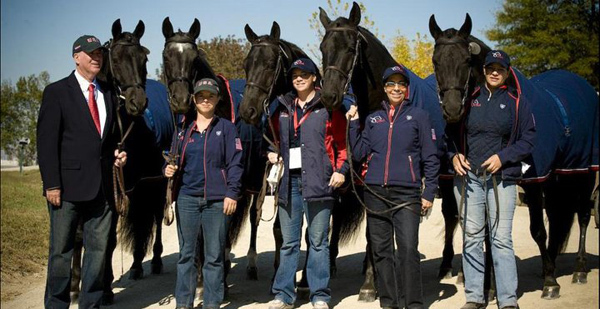 From the 25th of September until the 10th of October 2010, the U.S.A. was, for the first time in history, the host for the World Equestrian Games. 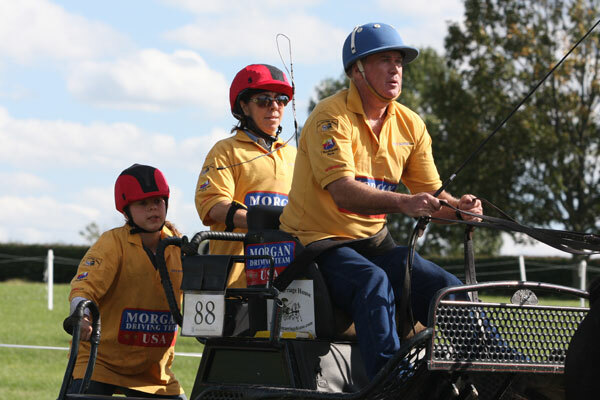 In July 2010 David ranked 5th for the U.S.A.
On Friday the 13th of August, the FEI has announced that David is one of the 10 USA driving team entries for the WEG. “Behind every strong man, is a strong woman” and David litterally had 2 strong women behind him during every marathon in preparation for the WEG: on the top step is Maureen Aulson, owner of the horses, and on the lower step is Mieke Wouters, horse caretaker from Belgium. The disappointment was huge when 2 of the 5 horses where considered “unfit to compete”. In the true spirit of a good sportsman David and his crew staid in Lexington and supported all the other drivers. At the Equine Affaire in Springfield, MA, (11-13 november 2010) David performed for the last time with the Morgan four-in-hand of Alan and Maureen Aulson and this was also the end of that chapter. Since then David is looking for new chalanges and you can be a part of it!